Why wait for an official Android TV? 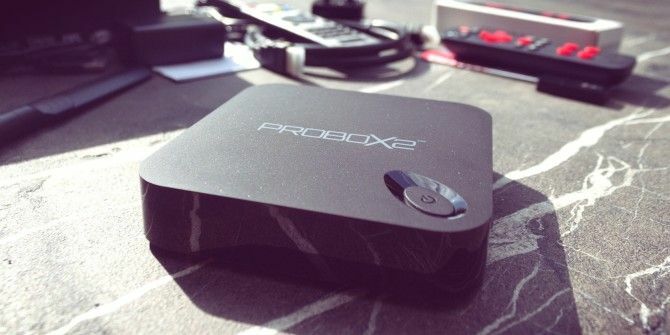 Android boxes designed for connecting to a TV have been around for ages – the Probox2 EX is the latest and most powerful model in the market. How does it perform, and does it serve a genuine need in the living room? Read on to find out, then enter to win your own at the end of the review. The Probox2 EX is available for $149 directly from Probox2.com, including the Remote+ air mouse and gaming controller. At two-thirds the price, the Rikomagic RKM MK902-16G (around $100) is at first glance a worthy competitor – however, it has a significantly less powerful GPU, no remote, and runs an older 4.2 version of Android. Similar specs to the Probox2 EX can be found in the Minix Neo X8H, though it costs $10 more, the remote doesn’t function as a game pad, and otherwise has no discernible benefits. Two remotes are supplied, though one is an additional “bonus” available as part of an offer – the suppliers have assured me that the bundle is being offered indefinitely, but you should always check before ordering. The first remote supplied in the package is a generic media centre infra-red controller. In testing, I found it to be less powerful than most other IR remotes in my living room, with a smaller range and field of use – a small object in front of the Probox2 EX seemed to block it entirely. Otherwise it’s everything you’d expect from a cheap, standard IR media centre controller and doesn’t really warrant talking about further. The real star of the package is the “Remote+”, which bears more resemblance to a primitive gaming controller, requires that you plug in a separate Bluetooth dongle to one of the USB ports (which then automatically pairs the device), and is significantly more responsive and easier to use. The Remote+ offers 3 different modes of operation. First, the standard controller, which is a responsive experience suitable for general menus, using the d-pad and a single button for most interactions in a familiar upright layout. Second is air mouse mode, in which a cursor appears on-screen and is controlled by motion thanks to the built-in accelerometer; it’s still an arduous process to use an on-screen keyboard, but it’s the best solution I’ve seen yet to an unsolvable problem. Lastly is a horizontal game controller mode, which basically turns around the orientation of the d-pad as if it were an old NES controller. The features of the Remote+ don’t end there though: a microphone is also built-into the device, useful mainly for video conferencing but also of good enough quality to interact with Google Now and other voice applications without having to scream across the room. There’s a dedicated voice button on the remote, simply press that to enable voice input wherever possible. The Remote+ is perfect for retro emulation gaming, up to about the Dreamcast era when analogue controls were introduced. I tested it out with SNES9X and it worked flawlessly except for a minor issue of having to assign a start button, for which I used the central volume up key. I also tested with Reicast (a Dreamcast emulator, read more about Android retro gaming emulators Easily Turn Your Android Device into a Retro Gaming Hub Easily Turn Your Android Device into a Retro Gaming Hub With an Android device, you can easily play all sorts of retro games made for systems like the Nintendo 64 or GameBoy Advance! Read More ), and the system handled the graphics beautifully at around 50 FPS. The Remote+ was fine for Galaga, but as I mentioned, you’ll probably want to pair with a Playstation controller How to Connect a PS3 Controller to Your Android Phone or Tablet How to Connect a PS3 Controller to Your Android Phone or Tablet If you have an old PS3 controller laying around, connect it to your Android phone or tablet for an awesome mobile gaming experience. Read More for anything more complex. Antutu scored an admirable 39,000 (unverified, for some reason), in line with modern handsets like the Galaxy S5 and Note 3. It does this with a capable quad-core Amlogic processor and a toasty Mali 450 GPU, though the 3DMark was less impressive at around 9500 (though still pretty awesome). More importantly, app loading times are barely noticeable thanks to the speedy eMMC storage, and the only point I found myself frustrated with slowdown was when trying to load my media library from a NAS-based Plex server using the built-in Media Center app. Probox2 EX comes with it’s own specially designed launcher – nothing to write home about, and has big screen icons sorted into categories which you can add your own favourites to, so your apps are only ever a few taps away. With Android being what it is, you can of course rip out the launcher and replace it with one of your choice, but I found no need. It’s quick to navigate without any nonsense getting in the way. If you’re more of a widget kind of person, you’ll probably want to replace it. There’s a number of media apps included out of the box, including XBMC, and a sub-standard generic “Media Center” – which doesn’t display metadata, thumbnails or subtitles. BubbleUPnP was a quick download though, and easily fulfils my needs of connecting to a remote Plex server. In fact, it’s actually better than the real Plex app, which refuses to play most of my media due to the fact that both server and client run on non-x86 CPUs. BubbleUPnP bypasses this by simply grabbing the raw file, and the Probox2 EX is more than capable of decoding anything I throw at it. Media playback was silky smooth through MXPlayer, streaming HD content nicely over a local network share with subtitle support. A Miracast app is also included, and though AirPlay support is claimed, I could only get it to receive audio (this could be due to iOS 8, but I don’t have any older devices sitting around to test with). Should You Buy a Probox2 EX? With Android TV recently unveiled by Google as the official interface of next generation TVs and set-top boxes, this is probably one of the last devices you’ll find trying to squeeze regular old Android onto a TV format, and it does the best it can. While the Probox2 EX itself is a more than capable bit of hardware, the existing interface problems inherent with Android on a device without a touchscreen are ever-present. This is true of all current Android set-top boxes though, so it’s not something we can fault the Probox2 EX for specifically. If you’re in the market for one of these devices, the Probox2 EX offers excellent value for money with capable hardware and a nifty little controller that’s perfect for retro gaming. But apart from the replacement launcher, it just doesn’t solve any of the bigger issues with surrounding Android on a TV. How Do I Win The Probox2 EX? Explore more about: Android TV, MakeUseOf Giveaway, Media Player. I'm all about the gadgets... I want one.. Does it work with a DVB-USB stick ? Thanks MakeUseOf, I watch all your reviews on YouTube and I like it! Wow, android-tv-box- is fab. & splendid. 2 fingers snap. It is tight, fly & off the chain. Thank you for the awesomeness, the contest, and generosity. Would really like to know of this box does hardware or soft decoding of video? I believe one of the minix models does now...not sure. It's amazing what this thing can do.. I would love to try it out. The specs are incredible. I have to do some research on it! Thanks! Free looks like the only way I would want this. It might make a nice gift, for someone who has every OTHER gadget. Hey! I *almost* bought the Minix last night, after seeing a reference to it on Reddit. Now I have this to see if I win, and then purchase if I don't! 2bitGary .... I was wondering the same thing? The review mentioned alot about the gaming uses of this devise but not much about it in TV mode or compared to the Roku or other TV streaming boxes, even though most don't play games, I think the main point of buying these boxes is to play TV shows/movies etc. So how is this box with TV programs and in comparison to Roku Apple TV etc??? How would you compare this to Roku? Seems like it could be an interesting alternative. I was wondering this myself. The remote (with the red buttons) looks an awful lot like my Roku remote.